My first novel, The Storms of Denali, is a disaster epic in the tradition of Into Thin Air and The Perfect Storm. Four young men set out to climb a new route on the 20,320-foot peak, the highest and coldest summit in North America. They battle avalanches, fierce winds, and mind-numbing cold to ascend a classic new line up the south face. In confronting these obstacles, the group splinters, leading inexorably to tragedy. The book opens as the group descends the south ridge in the midst of a gale. They are suffering from frostbite, hypothermia and High Altitude Pulmonary Edema. The clouds are closing in. They debate where to go, but in their exhausted, hypoxic state, the discussion degenerates into bickering. The group splits up, breaking one of the cardinal rules of climbing. The novel then returns to the chronological beginning of the story, describing how the four men decided to climb the peak and how they set out to do it. Like Into Thin Air, The Storms of Denali includes expert descriptions of the climbing, allowing non-climbers to understand and identify with what’s happening on the mountain. It features sharply-etched portraits of the team members—John Walker, the first-person narrator, a family man who considers this his last shot at mountaineering glory; Wyn Mitchell, a world-class climber with a risky, go-for-broke style who uses the climb as a stepping stone to Everest; Al McKenzie, a Boeing engineer, who hopes the climb will help him forget his divorce; Lane Frederickson, a fireman and novice climber, who clashes frequently with Wyn, the group leader. The Storms of Denali gives full and vivid treatment to these characters–their strengths, weaknesses, and how they combine into a volatile mix that ends in disaster. I’ve published three nonfiction books: On Sacred Ground: The Spirit of Place in Pacific Northwest Literature (University of Washington Press, 2003), Beyond Risk: Conversations with Climbers (Mountaineers, 1993, also published in Canada, England, Japan, Italy, Poland, and the Czech Republic); At the Field’s End: Interviews with 22 Pacific Northwest Writers (U.W. Press, 1998) which won the Pacific Northwest Booksellers Award and Washington State Governor’s Award and “Contemporary Ecofiction” (1996) for Charles Scribner’s. I also have contributed to National Geographic Adventure, Outside, Hooked on the Outdoors, The New York Times, The Wall Street Journal, Sierra, Rock + Ice, and have published short stories in literary journals. I’m an experienced climber, having ascended Denali, Mt. Rainier, the Matterhorn, Mt. Blanc, the Marmolada, and Island Peak in the Himalayas. I earned a B.A. in French from Amherst College (1980), an M.F.A. in Fiction Writing from the University of Washington (1985), where I studied with Charles Johnson, winner of the National Book Award for Middle Passage. In 1996, I completed a Ph.D. in English at the University of Washington in 1996, and now teach writing classes there and at The Writer’s Workshop. For more about the book, take a look at this video. This book is a page turner. Nick O’Connell clearly knows a great deal about mountain climbing and how to couple this knowledge with a compelling and gripping narrative. 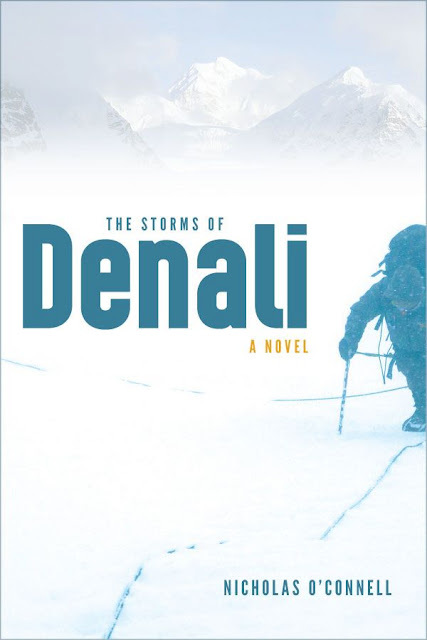 There’s plenty of tension and drama in The Storms of Denali. It will be entertaining and engaging for readers even if they don’t know much about climbing. David Guterson, author of Snow Falling on Cedars, Ed King. –Lou Whittaker, author of Memoirs of a Mountain Guide and Founder of Rainier Mountaineering, Inc.
Nick O’ Connell has portrayed the risks, joys, emotions, and hard labor experienced during the ascent of North America’s most frigid mountain. In his novel he displays a full comprehension of these varying experiences and dangers that may be encountered in surviving Denali. –Fred Beckey, a legend in climbing circles, has made more first ascents in North America than anyone else. He’s the author of Fred Beckey’s 100 Favorite North American Climbs. –Charles Johnson is the author of the National Book Award-winning novel, Middle Passage. An extraordinary novel. Through verisimilitude and candor rarely found in the nonfiction literature of North America’s highest peak, O’Connell plumbs the motivations, risk, and nuances of an ordinary climber’s life. The mounting tension, deft characterizations, and sun-burnt realism of The Storms of Denali transport the reader more vividly than any other book about the mountain. –Jonathan Waterman, author of In the Shadow of Denali and Running Dry. Nick O’Connell has crafted a remarkable story of risk, death and survival on Denali, the coldest big mountain in the world. Every reader – climber or not – should find this account of a difficult and dangerous ascent both absorbing and mesmerizing. There is a short list of memorable works of fiction about climbing. The Storms of Denali deserves to be among them. –Jim Wickwire was one of first two Americans to summit K2 and co-author of the memoir, Addicted to Danger. –Garth Stein, author of the bestseller, The Art of Racing in the Rain. Whether you’re an experienced climber or an armchair mountaineer, you’re going to enjoy the read. Nick’s taken his experience as a mountaineer and his expertise as a writer and delivered a great story, told very well. –Phil Ershler of International Mountain Guides made the first American ascent of the north side of Everest and wrote Together on Top of the World. The Storms of Denali captures the odd magic created from the hardships, sublime beauty, and pure adventure encountered while climbing Denali. This is a great story, written by an author clearly familiar with the Denali experience. The story tackles some of the calculus that leads climbers and push themselves and risk their very lives in an effort to bring beauty and balance to their existence. Destined to become a classic in North American climbing fiction. –John Race, longtime Denali Guide and director of The Northwest Mountain School. The Storms of Denali is a novel based at least in part on true events. I climbed the 20,320-foot peak back in the 1980s, and was deeply affected by the savage, austere beauty of the place as well as by the danger and drama inherent in the trip. Shortly after our group left base camp, we met a party towing a body on a sled. It turned out that a woman from a Sierra Club expedition had fallen into a crevasse and her team had been unable to retrieve her quickly enough to keep her from dying of hypothermia. This was very sobering, but it didn’t dissuade us from continuing, which says something about the mentality of climbers. This incident served as inspiration for the section in the novel where John and the others meet the party carrying the dead body. That trip and subsequent climbing experiences formed the basis of the novel. In 1993, I published Beyond Risk: Conversations with Climbers (Mountaineers, also published in England, Italy, Poland, the Czech Republic and Japan) where I interviewed the world’s most famous mountaineers, including Sir Edmund Hillary, Reinhold Messner and Chris Bonington. In addition to conducting the interviews, I had a chance to climb with many of them, getting real insight into what drove them and why they excelled. These experiences inspired me to write more about the subject, which I did for Rock & Ice, Outside, National Geographic Adventure, Alaska Airlines Magazine and other publications. I found mountaineering incredibly rich as a subject, given the inherent risk, stunning landscapes and outsized personalities of elite alpinists. As I became more immersed in it, the line between writing about it and pursuing it blurred. I became addicted to the physical challenges, heart-pumping adrenalin, crazy idealism, strong partnerships and the stark, elemental world of the peaks. I learned techniques of rock, snow and ice climbing, and gradually became an accomplished mountaineer in my own right. I ascended most of the major peaks in the American West including Grand Teton, Mount Whitney and Mount Rainier. I traveled to Europe to tackle fabled summits like the Matterhorn, Mont Blanc, the Marmolada as well as Island Peak in the Himalayas, a 20,305-foot spire not far from the Everest Base Camp. I published stories about these trips in magazines. As much as I enjoyed writing these nonfiction pieces, I realized they couldn’t convey the full drama and psychology of the sport. So I dove into writing a novel about it. In doing so, I hoped to build on a rich tradition of novels like Solo Faces by James Salter and Banner in the Sky by James Ramsey Ullman, as well as nonfiction books like Jon Krakauer’s Into Thin Air and Joe Simpson’s Touching the Void. I wanted to write a contemporary novel that would combine the detail and grit of a nonfiction account with the drama and exploration of character of a fictional story, giving full measure of the beauty, danger and inherent appeal of the sport. To this end, the route that the team attempts in The Storms of Denali is a potential new line, one I discovered in examining maps of the peak. The McKenzie-Fredrickson Memorial Route remains to be tackled by a party strong enough to pull it off. This will add to the novel’s appeal, as the route will immediately attract the best alpinists from around the globe. 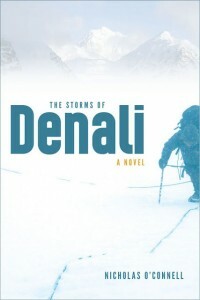 Unlike some film versions of mountaineering, The Storms of Denali is a novel saturated in the lore, history and deep knowledge of the subject. In addition to my own expertise, I have consulted a number of guides on Denali to make sure all the details in the book are true and the portraits of the climbers and the climb are accurately drawn. Today, I continue to climb, though not on the level I once did. Like the book’s narrator, I’m married with children. I have twin boys age 15 and a daughter age 11. Strikingly, it’s my daughter who has inherited the climbing gene, and though this pleases me as a climber, it troubles me as a parent, because I know all too well the risks of the sport. It’s this kind of tension that animates The Storms of Denali, making the narrator and others debate the risks and rewards of the mountaineering. What is an acceptable level of risk in climbing? How can you strike a balance between risk and reward? What part does risk play in an adventurous life? These are some of the questions the novel explores in a way I hope is entertaining, enlightening and compelling. Though these questions are posed mainly in terms of climbing, they really apply to the risks and rewards of life itself, magnified through the lens of mountaineering. I hope you enjoy the ride! Nicholas O’Connell, M.F.A, Ph.D., is the author of The Storms of Denali (University of Alaska Press, 2012), On Sacred Ground: The Spirit of Place in Pacific Northwest Literature (U.W. Press, 2003), At the Field’s End: Interviews with 22 Pacific Northwest Writers (U.W. Press, 1998), Contemporary Ecofiction (Charles Scribner’s, 1996) and Beyond Risk: Conversations with Climbers (Mountaineers, 1993). He contributes to Newsweek, Gourmet, Saveur, Outside, GO, National Geographic Adventure, Condé Nast Traveler, Food & Wine, The New York Times, The Wall Street Journal, Sierra, The Wine Spectator, Commonweal, Image, Rock + Ice and many other places. He is the publisher/editor of The Writer’s Workshop Review and the founder of the online and Seattle-based writing program, The Writer’s Workshop.